The Spruces are tough trees. Their superpower is surviving harsh conditions like extreme cold, wet, snow, and wind. Such conditions exist at high elevations or regions close to the poles. Elevation divides plants into what Botanists call “belts,” each belt consisting of types of plants suited to conditions at that elevation. Spruce trees can thrive at the very highest belt in which full sized trees can grow, from about 9,500 feet (2900 m) to 11,500 feet (3500 m) in the Rocky Mountains and 4,500 feet (1372 m) in the Alleghenies of Tennessee and North Carolina. Latitude separates trees in a similar manner. And spruce trees thrive at lower altitudes in far northern regions. Acadia National Park is in Maine, at the 44th parallel, a latitude at which there are many broad-leaved trees. And the highest point in Acadia National Park is Cadillac Mountain is only 1530 feet (466 m) high. I was therefore surprised to find a spruce forest there. However, it is a rocky peninsula jutting out into the Atlantic where it is slammed with storms. And in such conditions, spruces have an advantage. 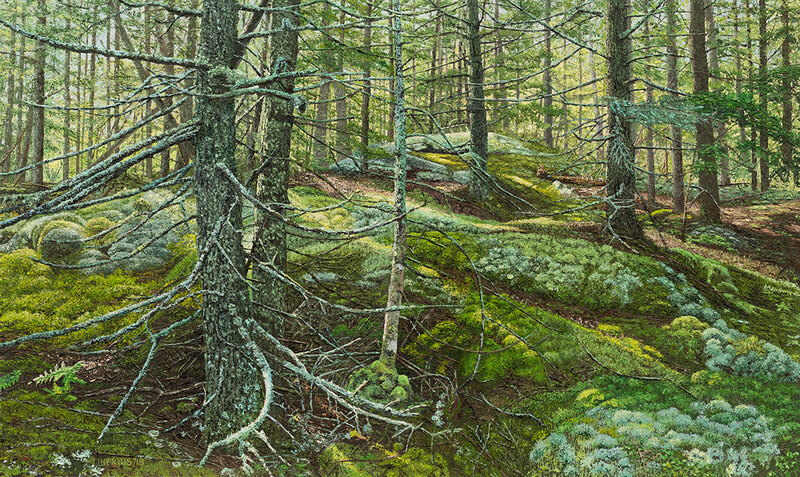 In this scene that I have painted, the extreme wet conditions are obvious from the heavy encrustation of lichen on the trees and the pillows of moss covering everything. 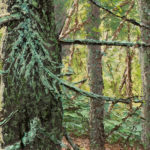 The lichen and blue-green mosses provide a striking contrast to the yellow streaks of sunlight, creating the artistic theme of the composition. 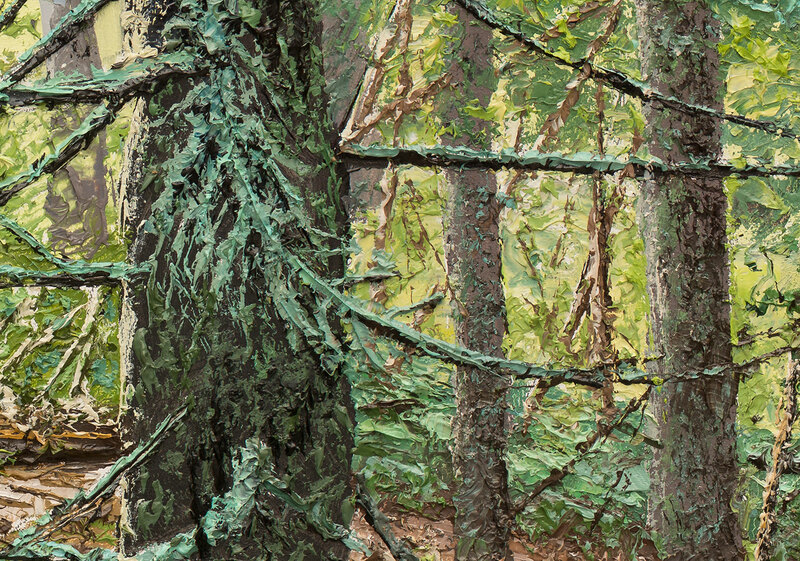 It was particularly satisfying to make the bark on the trees and the mosses with a painting knife. I skipped the knife over the panel to make the bark stick out like shingles. And, using the edge of the knife, I cut thousands of grooves into the paint to make the moss look soft. As for the species of spruce, the needles were too short for red (Picea rubens) or white spruce (Picea glauca). They were more likely black spruce (Picea mariana).